The Hamilton Health Sciences Women’s Health Clinics offer compassionate care for women and their families. We provide a variety of specialty services for women throughout the life stages, in the fields of general obstetrics and gynecology, high risk maternal fetal medicine, prenatal diagnosis and uro-gynecology. 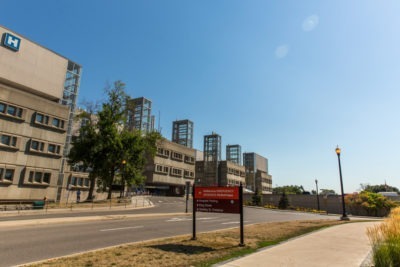 McMaster University Medical Centre is the regional center where maternal fetal medicine specialists provide focused care for women with high risk pregnancies and their families. Directions to 4B1: Located on level 4 in the red section. Exit red elevator, straight ahead, first right, follow signs to 4B1 Maternal fetal Medicine clinic. McMaster University Medical Centre offers leading edge, minimally invasive surgery for the majority of benign gynecological surgical procedures. We provide specialists in uro-gynecology and general gynecology services and general obstetrical care for low-risk birth. Directions to 2F: Located on level 2 in the red section. Exit red elevators and turn to right, head left down hallway, clinic is on your right. The women’s health clinic at McMaster University Medical Centre provides gynecology assessment services for patients experiencing early pregnancy complications or loss as well as complications after gynecology surgery. Non-stress tests and outpatient care for pregnant women takes place here. The Sexual Assault/Domestic Violence Care Centre provides specialized healthcare for children, adolescents, women, transgender persons, and men who have experienced sexual assault and/or domestic violence. Learn more about the Sexual Assault/Domestic Violence Care Centre. Learn more about terminating a pregnancy.